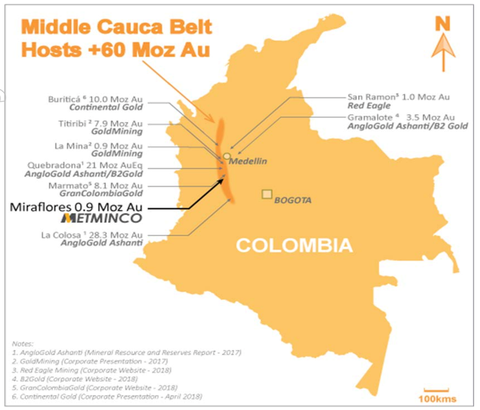 Metminco Limited (ASX:MNC | AIM:MNC) has announced assay results for the first two diamond drill holes from its Tesorito gold prospect at its Quinchia Gold Portfolio in the Quinchia district of Colombia. The Quinchia district is located in central Colombia within the prolific Middle Cauca Belt. This region is host to numerous large- scale projects including AngloGold’s 28Moz La Colosa and Gran Colombia’s 8Moz Marmato gold deposits. The Tesorito prospect occurs 800m south east of the MNC’s Miraflores deposit (0.88Moz gold Resource) and approximately three kilometres south-east of its Dosquebradas deposit (0.92Moz gold NI 43-101 Resource). It is also located approximately two kilometres north of the large undrilled Chuscal porphyry target. 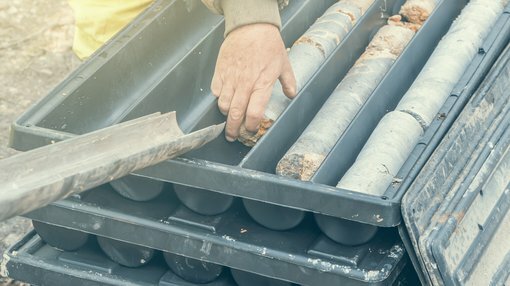 MNC’s current 1500m diamond drilling program is designed to confirm and expand the gold mineral system intersected in drilling by a previous operator. MNC expects to receive assays for the remainder of TS_DH_05, 06 and 07 in August. What these results will show is yet to be determined, so investors should take all publicly available information into account and seek professional financial advice before making an investment decision. This and previous drilling confirms the gold mineralisation (over 0.5 g/t Au) is extensive in area (400m x 180m) and is open laterally to the north-northeast, east-southeast and at depth. This included hole TS_DH_02 which reported 384m at 1.1g/t gold from surface to end-of-hole. The program will also test a previously undrilled geophysical anomaly located approximately 300m to the northwest of TS_DH_02. MNC believes the mineralisation at Tesorito represents the gold-rich cap of a deeper base-metal rich porphyry system. This view is supported by the phyllic alteration and increasing base-metal content and igneous activity with depth seen in several holes. The intensity of hydrothermal alteration seen at Tesorito together with prolific gold mineralisation already recognised in the Quinchia district and elsewhere in the Cauca belt suggests this to be major mineralising system which offers great potential for exploration success. This latest news comes after a broker report from Stockdale Securities earlier this month when it initiated coverage with a “Buy” rating. At that time all assay results from MNC’s Tesorito gold prospect were pending, and Stockdale noted that it expected “a re-rating of MNC’s stock on the back of results, confirming extensive gold mineralisation”. In addition to the assay results, the broker also notes that negotiations are on-going with AngloGold Ashanti for a formalised Joint Venture agreement allowing MNC to follow up on a significant gold-in-soil anomaly (>0.5g/t Au over a 500m x 250m area) at the nearby Chuscal prospect.